The Anti-Discrimination Commission Queensland takes a strength-based approach to community engagement work. Between 2013 and 2015,we worked intensively with the Lockyer Valley community: building strong relationships with the community and key stakeholders, and helping them work together to tackle human rights concerns. The report, Start somewhere, go anywhere : how a community development approach worked in a government setting , was produced by staff from the Community Engagement team. Access the Start somewhere, go anywhere report. For information about any item not listed on the order form, please contact the Commission. 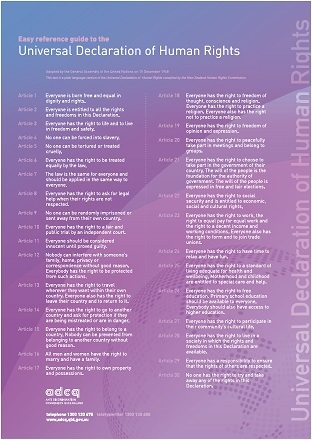 The Easy reference guide to the Universal Declaration of Human Rights is a full colour A3 size poster with the 30 articles of the Declaration in simple English. Text of the Easy reference guide is available here (File, 47.2 KB) . 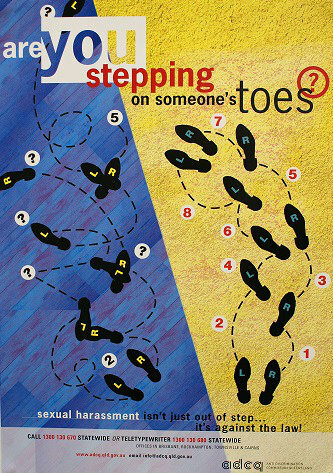 Example of Universal Declaration poster in purple and blue with white text. 20th Anniversary - Eleanor Roosevelt is a full colour A3 size poster. For the full text see the 'Fair and Inclusive Qld' page. 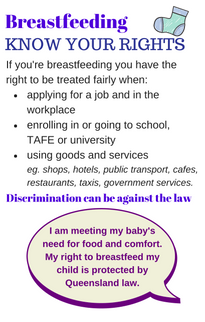 New rights cards and a breastfeeding fact sheet now available. 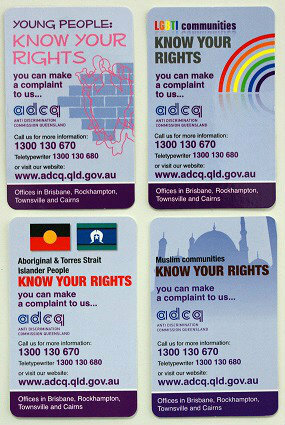 Examples of full colour Know your rights cards giving contact details. Working it through is a six minute video explaining how conciliation conferences are run at the Commission. It is useful for complainants, respondents, legal representatives and others who may attend a conciliation conference as a friend or support person. There is no charge for this item. 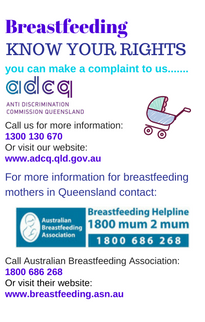 The Anti-Discrimination Commission, in consultation with the Queensland Civil and Administrative Tribunal has produced an information video for applicants, respondents and advocates in discrimination matters. An inclusive workplace is one where the human rights principles of fairness, respect, equality and dignity are promoted and are part of the organisation's everyday goals and behaviour. The material contained in this kit will assist employers to set out their organisation's commitment to tackle discrimination and sexual harassment and promote equality and diversity in areas such as recruitment, training and management. These are important steps on the way to creating an inclusive workplace.